Areela Boutique Hotel is situated in the heart of Tirana, in one of the antic neighbourhoods in town and just 350 metres from Skanderbeg Square. Surrounded by peace and quiet, this hotel offers air-conditioned rooms, free Wi-Fi and a tea room in the hall. Closed parking is free of charge. 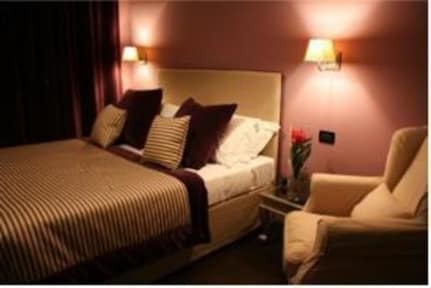 Areela Boutique Hotel is located 7 minutes away from the centre of Tirana. Tirana is the capital of Albania. It is an interesting and charming city, with a lively night life. In the hall you can enjoy the on site bar for a coffee or different tastes of tea. Every morning you can enjoy the tasteful breakfast served on the lobby bar. Rooms are elegantly furnished in chic and industrial style ,all restyled recently and feature air-conditioning, a flat-screen TV with satellite channels and a minibar. Private bathroom offer a rainforest shower, hairdryer and free toiletries. Furnished balconies are available in some rooms. The underground vallet parking is free of charge for all the guest. Credit Cards accepted (Visa, Mastercard, Visa electron, Maestro, American Express). There is no availability for Hotel Areela on your selected dates. This lovely boutique hotel has a quiet, oasis-like lobby & breakfast room - they’ve taken care to decorate it with sweet, personal touches. The breakfast has options for a variety of preferences. My room was in the basement, but it was lovely - spacious, bright, cheery and, with a long window above the bed, I didn’t feel closed in. The shower & bathroom are one room, but large enough for both. It was quiet at night & I slept incredibly well. My only need was for towel hooks & a small table. Nice hôtel, staff are friendly and helpful if you ask for information. It's 15-20mn walk from the city center depending where you want to go. The breakfast is pretty copious if it's included for you.